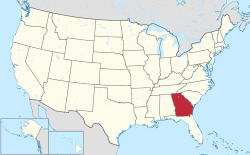 Georgia  is a US state in the South. The state was named for Great Britain's King George II. Founded in 1733, it was the last of the 13 original colonies that became the first 13 US states. Georgia is more diverse than many Americans realize, with a scenic seacoast, mountains higher than any peaks in Britain, and large cities as well as extensive rural areas. Its historic sites focus mostly on the Antebellum and Civil War eras and the civil rights movement. (Atlanta was the home of Martin Luther King Jr.) Warm Springs was the Southern home of President Franklin D. Roosevelt, and he died there in 1945 shortly after beginning his fourth term in office. It's a must for tourists interested in the Great Depression or World War II. Dalton - Carpet Capital of the World! Valdosta - Home of Wild Adventures! Morrow - Home of Clayton State University! Norcross - A Place to Imagine! Many (but not all) Georgians speak with southern accents. Non-native English speakers may have difficulty understanding them. Many native Georgians speak in the dialect of the American South. This dialect changes slightly as you cross through each region, and will be more so in rural areas. People in the South generally speak more slowly, carefully, and politely than those from the North. In particular, English speaking visitors from larger cities or other regions will have to adjust to the different pace of speech if they visit Georgia's smaller towns. Speaking quickly and bluntly can be perceived as inconsiderate or rude, and may gather a negative response. Urban areas such as Atlanta will have several different dialects and accents, along with other languages due to the diversity of the people that live there. Spanish is also spoken by small portions of the population throughout Georgia. Interstate 75 (I-75) passes through Georgia from northwest to southeast, connecting Dalton in the north, Macon in the middle of the state, and Valdosta in the south. Interstate 85 (I-85) enters Georgia from Alabama near the rural town of LaGrange, and passes from southwest to northeast to eventually run into South Carolina. I-75 and I-85 run together for 7 miles in the middle of Atlanta to create I-75/85 or the Downtown Connector, which is 14 lanes wide at its widest point. Because of its proximity to everything in the city, this is often where much of Atlanta's infamous traffic tends to occur. Interstate 95 (I-95) is the main highway serving the East Coast of the United States. As it passes through Georgia, it connects the coastal cities of Brunswick and Savannah. Interstate 20 (I-20) runs west to east from the Alabama state line to the South Carolina state line, entering Georgia near Tallapoosa and exiting the state near Augusta. It also runs through the Atlanta metro area, where it has an interchange with I-75/85. Interstate 16 (I-16) begins at an interchange with I-75 in Macon and travels southeast to the city of Savannah. Interstate 285 (I-285), also known to locals as "The Perimeter", is a beltway around the city of Atlanta that connects I-75, I-85, and I-20. It is an excellent way to bypass some of the heaviest traffic (though you'll still encounter a healthy amount). The interchange of I-285 with I-85 is so notoriously loopy and complicated-looking that locals call it "Spaghetti Junction". Little Sacrifices, by Michelle Gorman (as Jamie Scott). When Duncan and Sarah Powell move with their daughter, May, to Savannah Georgia in 1947, they hope against hope that they’ll be welcomed. But they’re Yankees and worse, they’re civil rights advocates almost a decade too early. At first May can pretend they’re the same as everyone else. It means keeping quiet when she knows she should speak up, but it’s worth the sacrifice to win friends. Unfortunately her parents are soon putting their beliefs into action. And when they wake to find that they’re the only family on the block with a Ku Klux Klan cross blazing on their front lawn, the time comes for them to finally decide between what’s easy and what’s right. Midnight in the Garden of Good and Evil, by John Berendt, Shots rang out in Savannah's grandest mansion in the misty,early morning hours of May 2, 1981. Was it murder or self-defense? For nearly a decade, the shooting and its aftermath reverberated throughout this hauntingly beautiful city of moss-hung oaks and shaded squares. Berendt's sharply observed, suspenseful, and witty narrative reads like a thoroughly engrossing novel, and yet it is a work of nonfiction. Berendt skillfully interweaves a hugely entertaining first-person account of life in this isolated remnant of the Old South with the unpredictable twists and turns of a landmark murder case. Georgia Aquarium The largest aquarium in the world with tens of thousands of animals in 8 million gallons of water. Turner Field-A homeground for the Georgia's Major League Baseball team, Atlanta Braves- Once used as the Olympic field in 1996 Atlanta Olympic Games. Fox Theatre-Opened in 1929 first as a movie palace and now showing many artistic events. Zoo Atlanta-Located next to the Underground Atlanta with giant panda being the most popular animal in the zoo. Sunbelt Agricultural Exposition October of every year. Located in Moultrie, GA People from all over the world come to it. Coca-Cola, a soft drink known all over the world, was invented in Georgia in 1886 by Dr. John Pemberton, an Atlanta pharmacist. As you might expect, it's an extremely popular drink in Georgia, so much so that the word "Coke" has become synonymous with the word "soda" in some parts of the state. Many Southerners who order Coke at restaurants where it may not be served may be mildly upset upon being asked by the server, "Is Pepsi okay?" The World of Coca-Cola is a tourist attraction in downtown Atlanta dedicated to the history of the drink, with a sample room enabling visitors to taste Coke products from all over the world. Mint Juleps are a uniquely Southern cocktail usually associated with the Kentucky Derby, a famous annual horse race run on the first Saturday in May. The drink is a combination of mint, bourbon, sugar and water and is most commonly served on Derby day or during Derby season. Sweet Tea is a popular drink across the entire South. If you order tea in a restaurant without specifying anything else, this is likely what you'll get. It consists of green or black tea with lots of added sugar, served over ice. While the sweetness can be an acquired taste, it's a ubiquitous Southern beverage and worth a try at least. As a rule, Georgia is fairly adherent to Southern standards of respect. When in doubt, referring to someone as "ma'am" or "sir" is never a bad idea. You'll especially hear these terms used by younger people to address older people, as many children in the South are raised to respond to their parents this way. Southerners in general are also much less direct about touchy topics and criticism, especially of another person. Euphemisms are common, and if someone says "bless your heart" in response to somebody else's mishap, it might not be all that complimentary! Many Georgians will not share their political beliefs or controversial opinions with someone they don't know well, and pushing somebody to share such information is impolite. To this end, small talk is mostly expected in conversation; walking up to somebody and demanding something without greeting them is usually seen as rude. When talking to cashiers, service workers, or even acquaintances, be prepared to be asked how you're doing and to ask them in return. Bluntness or talking over somebody, unless you're very close with them, will make you appear disrespectful of the other person's time and feelings. Georgia is very aware of its Confederate history and the connotations that come with it. You may see a house flying a Confederate flag outside, or see news stories about people protesting against statues of famous Confederate leaders outside public buildings. Opinions within the state vary widely. Some Georgians see the flag as a simple symbol of the state's heritage and history, and display or wear it with immense pride, while others view it as a symbol of slavery and believe that venerating the flag or the former leaders of the Confederacy is tantamount to supporting slavery and racism. Whatever your beliefs, it is wise not to comment on the Confederate flag if you see one at all unless you know the personal views of the people you're with. Tactful ignorance is usually the best way to go. 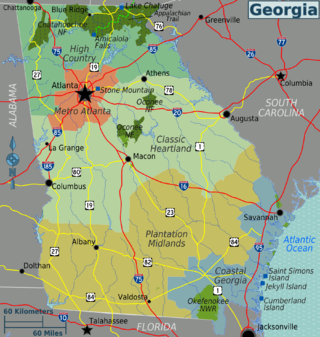 Much of Georgia outside of the Metro Atlanta area is very conservative and religious. 79 percent of Georgians identify as Christians, and you may see this affecting everyday life often. Many stores are closed on Sunday so the employees can (ostensibly) attend church and spend time with their families, and alcohol is not sold on Sundays in some parts of the state. Though this might be inconvenient at times, do not make jokes about Christianity or make insulting statements about Christians, Jesus Christ, or someone's level of devoutness. It is in poor taste to poke fun at someone's religious beliefs and practices in general, and people of all faiths are welcome in Georgia. The state's residents are aware that the majority of people are Christian, and pointing out this fact is seen as very rude, not to mention a little obvious. Georgia ranks among the states with the most military members, both per capita and overall, and there is a deep respect for both active duty servicemen and veterans. While less and less common, racial problems still exist. Certain areas of the United States, including the southern regions and rural areas of the Midwest, typically carry more socially conservative views. While the LGBT community is gaining more widespread acceptance, travelers are advised to avoid public displays of affection. Gun ownership is relatively common in Georgia as well as the rest of the South, especially in rural areas. It is unusual to see a gun in everyday life, but it is still a possibility. Gun owners are generally responsible with their weapons, and there is no cause for alarm or panic if a person is seen with a gun. It is wise to exercise caution in places like nightclubs, where shootings are not unheard of. Do not approach or cut through a stranger's property at night if you are in a rural area or the outskirts of a city. Most people who have bought a gun have done so for protecting their family and property. In the metro Atlanta area and other small urban areas throughout Georgia, do not leave valuables where they can be seen in your vehicle when the vehicle is unattended. Georgia is home to many species of venomous snakes. Tread cautiously in high grass and in woodlands, as many of them are the same color as their surroundings. Like much of the South, Georgia can be oppressively hot and humid during the summer. Shorts and flip-flops are widely accepted indoors and outdoors during the summer months. In the same vein, at nice restaurants you can often get away with shorts as long as you wear appropriate shoes and a collared shirt. This is easier during the day than in the evening. When in doubt, many establishments will gladly tell you the dress code if you call ahead and ask, and may even thank you for doing so instead of arriving underdressed. This can save you a lot of embarrassment and is worth the effort. Unfortunately, many people, especially those in offices, run the air conditioning down to 70F in the summer, and crank the heat up to 80F in the winter. As a result, dress that's appropriate for outside may not be suited for indoors. The best way to cope is to dress in layers, so you can adjust as needed. Florida - Bordering Georgia to the south is Florida, offering miles and miles of beaches, along with theme parks in Orlando. Alabama - Georgia's western neighbor is home to the Space and Rocket Center. Tennessee - Located northwest of Georgia, Tennessee is home to Great Smoky Mountains National Park as well as Nashville and its music related attractions. North Carolina - Georgia's northern neighbor is home to the Blue Ridge Parkway and Grandfather Mountain. South Carolina - Georgia's eastern neighbor has historic Charleston and the Hilton Head Island resort. This page was last edited on 26 March 2019, at 16:25.